Can you tell me the history behind the brand? 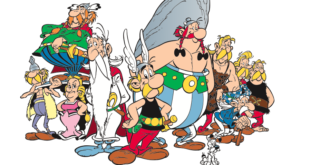 Asterix was born in 1959 thanks to Albert Uderzo his designer and Rene Goscinny his scriptwriter. Since then, Asterix has grown a lot and his adventures are related in a series of 35 albums. In total Asterix has now reached 355 million copies sold which made Asterix the world’s highest selling book series. More than a comic album hero, Asterix is now a global brand with many licensees, four live movies, nine animated movies and a leisure park in France which welcomes more than 1.8 million of visitors a year. 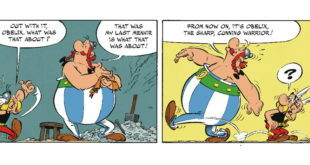 Translated in more than 110 languages, Asterix is present all over the world. 30 local publishers and ten licensing agents are working on the brand. How did the brand perform over the past 12 months? The last adventure of Asterix: Asterix and the Picts was released in October 2013 in more than 24 countries at the same time. Number one in many countries, total sales have reached now more than five million copies sold. In 2014, for the first time Asterix and Obelix were adapted in 3D in their first CGI movie – Asterix and the Mansions of the Gods. Released last November in France, the movie has been a great success with three million viewers. Moreover, we are also very proud of the developments we made in UK and in Eastern Europe within the year 2014. We have signed several new partners in Poland in board game, puzzles, apparel, bed linen, plus we had also a big loyalty promotion in Hungary at CBA stores during two months. We have around 100 licensees worldwide in many categories: apparel, bed linen, back to school, publishing, board games, puzzles, food, accessories and decoration. What are some of the best performing products? The best performing product is, of course, the original comics book. Other categories are also performing very well, like board games for example. Asterix is a brand dedicated to the whole family, parents have grown up with Asterix, so they love playing with games based on Asterix with their kids and introduce them the adventures of Asterix. Food and promotions are also key categories for Asterix. The style, the richness, the fun of the brand fit perfectly with those products. We will continue to work intensively on our key territories like France, Benelux and Germany where a big new partner will join our Gaul family in 2015. We have also strong expectations in our growing markets like UK, Spain, Italy and Eastern Europe. 2015 is a very busy year for our Gaul hero. 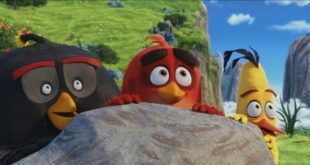 The new CGI movie will have an international release at the beginning of the year in many European territories like Italy, Germany, Poland. 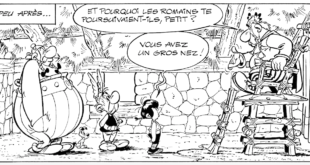 2015 is also the 50 years anniversary of Dogmatix, the little cute dog of Asterix and Obelix. Some operations and limited edition products will be launched to celebrate its birthday. In France, our Gaul heroes will be the summer brand of a big chain of petrol stations. To finish the year successfully, we will release in October on global basis a new adventure of Asterix. This new book will be the 36th of the series. What has the retail reaction been like to the brand? Our brand is a classic and ongoing brand with good values. Many retailers are looking for those criteria in a brand. Moreover, when we sold more than 1.5 million books in France at retail, we are of course well received. What are some of the main challenges you’ve come up against? And how have you overcome them? In such a competitive environment, the main challenge is how to exist among all brands in the market. Our strategy is to focus on our classic and evergreen brand positioning and also to launch each year a big event with Asterix. It could be a new comic album, a new animated movie, a new live movie. A year with a new album of Asterix is always a special year – we wish the best for this new book of Asterix.